"Thanks so much for everything you do for the girls! I just wanted to let you know how much "My daughter" is LOVING the volleyball and the practices. It's all she talks about... What you and IPV are doing for "My daughter" is really hard to explain.....from increasing her activity and health to improving her self-esteem.....I just can't tell you how much her Dad and I appreciate it." "Also, just to let you know, "My daughter" is having a great time at practice. This has been a great experience for her, she is loving it. So thank you!" "'My daughter' is having such a great time! You know it's good when she gets in the car and can't stop talking about everything she learned, what you guys worked on, and how badly her leg muscles were shaking during an exercise....all with a smile on her face and talking 90 miles an hour!!! She can't wait until Friday! You run a great program! Thank you so much for all you do!" "My daughter had a great time yesterday at her first volleyball tournament! Thank you for patience and guidance...She has expressed how much she is really enjoying the sport and the experience of a competition!" "My daughter really loved her first season of volleyball and tournament play. Thanks to everyone for making it such a fun experience." "Both my daughter and I love IPV and the experience she has gotten in your program...Without IPV she would never have progressed to the point she has and I can't thank you enough for everything you have done to make that possible." I Play Volleyball travel teams for upper elementary and middle school aged girls bridge the gap between our local program and higher level club opportunities. The season runs from Dec thru late Feb. Travel teams will participate in 3-5 tournaments in the Altoona, Philipsburg, West Branch areas. 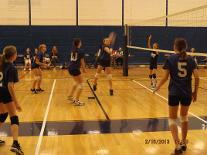 The season will end prior to the start of the State College Area Girls Middle School Volleyball season in March. 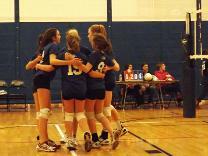 For 2014, we may also participate in several AAU or KRVA tournaments and may explore playing in nearby weekly league. Teams will typically practice 2x per week for 2 1/4 -2 1/2 hrs per session. Girls will begin to learn more advanced concepts and systems of play than what we have time to introduce in our local leagues. We will also continue to emphasize all-around skill development as the girls begin to learn various positional responsibilities. The primary age group for these teams is 6th-8th grades though younger kids who have both the ability and focus to move on to this level are welcome to participate. The cost for these teams will be $TBD / (last season was $250) These teams are suited for players who have the interest, focus and ability to take the next step in the sport of volleyball but might not be ready to commit to a more lengthy higher level club opportunity. All players will get playing time, but not all playing time will be equal and can increase or decrease based on attitude, skill development, work ethic, attendance and commitment level to the team. IPV also works very closely with Revolution Volleyball Club and Affinity Volleyball Club to identify and create a range of volleyball opportunities that serve both the current and aspiring young players in our area. Our Winter 2013 travel program had 2 teams from IPV Centre County. They included players from the following school districts and schools - Penns Valley, Huntingdon, Philipsburg, Bellefonte, Bald Eagle Area, Mt Nittany MS (State College), Park Forest MS(State College) and Young Scholars! *You DO NOT need to register with AAU, USAV or KRVA to tryout or play with IPV, unless and until we would choose to enter one of their sanctioned events. We have our own insurance. *WE MAY PARTICIPATE IN SEVERAL KRVA/AAU EVENTS IN WINTER 2014. Cost: Base of $250) - includes 2 t-shirt jerseys, gym rental, insurance, equipment, tournament entry*, coaching and admin. PARENT MEETING HANDOUT - PLEASE READ! TRAVEL TEAM PARENT SURVEY - PLEASE FILL OUT AND BRING TO FIRST NIGHT OF TRYOUTS! For Winter 2013-14 Huntingdon County players will play with the Centre County teams.